Jim spends his spare time working out at the gym, watching TV while pedaling away on a stationary bicycle, and singing in his church choir. He was a folk singer in his younger years and has recently gotten back into singing. Jim has conducted research in the realm of theoretical particle physics, but his primary interest lately has been scientific literacy. Many of the issues people face in the world today have a scientific component, and a basic understanding of the relevant science is critical to really understanding these issues. To address this knowledge gap, Jim is dedicated to explaining science to people who aren’t scientists. He does this to a large extent through writing books and articles for general audiences. Much of Jim’s current work also centers around teaching science to undergraduate students at George Mason University. Jim is motivated by the process of organizing complex thoughts, ideas, and scientific concepts in a way that makes it easier for others to understand them. During his childhood, Jim and his friends often visited the Field Museum and the Adler Planetarium where they lived in Chicago. They were fascinated by wonders of the scientific world they were exposed to there. Jim’s interest in science kept growing as he learned more. One day in high school chemistry, Jim’s teacher told him that he was talented in science and he should consider becoming a scientist. This possibility had never occurred to Jim before. Jim entered college planning to major in chemistry, but quickly switched to physics once he realized that this was where the answers to his most pressing questions could be found. During Jim’s time as a faculty member at the University of Virginia, he and a student wrote a paper together where they proved with impeccable logic and mathematics that a particular isotope of plutonium could not exist in the real world. About one month after this paper was published, researchers discovered their proclaimed impossible isotope embedded in ice in Antarctica. When Jim and his student went back through their logic, they discovered that one of the assumptions they made at the very beginning wasn’t true. These kinds of failures are part of science, and they highlight the need for open-mindedness and scientific humility. When Jim was conducting research in elementary particle physics, he realized that cosmic rays could potentially be a powerful high-energy tool researchers could use to better understand characteristics of elementary particles. Particle accelerators are often used for this purpose, but accelerators can only leverage a limited amount of energy to probe elementary particles. Cosmic rays are abundant in our atmosphere, and they contain more energy than the largest particle accelerators we can currently build. During a conference Jim was attending, one of the speakers acknowledged Jim’s outstanding advance in the data he could generate with cosmic rays, and this was a really proud moment for Jim. Jim was working as a postdoc at MIT at the same time that the experimental physicist Sam Ting was there. Sam was working on experiments all over the word, and he later went on to win a Nobel Prize for his research. One of Sam’s projects at the time was being conducted in Hamburg, Germany, and Jim was delighted to be invited to join the research group there for an extended time. Jim remembers the food in Hamburg fondly in general, but he particularly enjoyed the giant heaps of mashed potatoes bestowed upon him by the cafeteria workers. His family was able to join him in Hamburg over the summer, and Jim had a fantastic time getting to know the city. When Jim was at MIT, they would hold brown bag lunch events in this conference room with a big long table. He recalls a few striking interactions with renowned physicists like Steve Weinberg who later went on to become a Nobel Laureate. These were just normal people who happened to be really good at something. Jim also recounts the time he visited Cornell University as a young scientist to give a presentation about his work. A number of senior scientists including the renowned physicist Hans Bethe sat in the very front row. As Jim began to speak, Hans promptly fell asleep. He slept through Jim’s entire presentation, woke up at the very end, and then asked the best question of the whole session. Success comes not by wishing, but by hard work bravely done. When it comes to choosing a career, just be who you are. If you want to be a scientist, you should do it. However, if you want to be something else, do that. You should pursue what makes you happy. Jim grew up in Chicago, Illinois and hadn’t considered a career in science until a fateful conversation with his high school chemistry teacher. He has been dedicated to conducting research, teaching, and scientific writing ever since. Over the years, Jim’s research in theoretical physics has focused on elementary particle physics. His recent efforts have emphasized teaching at George Mason University and also promoting science literacy in the general public. 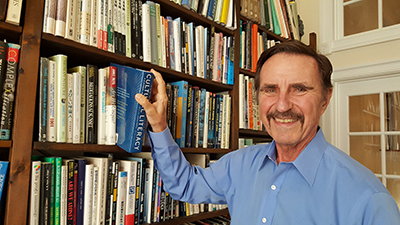 Jim is the author of more than 50 books and 100 articles in professional journals. Many of Jim’s books are written for a general audience to inform nonscientists about various exciting topics in science.